Arrived at 8pm. Management was waiting and directed us you our pull through spot. Advised us that the 30A breaker was not working and offered the use of a 50A adapter for our trailer. We had one, so didn’t need theirs. Quiet location, easy to get to and find. Owners of park were very helpful and friendly. We camped at Picketts RV Park (formerly Alamo RV Park) in a Travel Trailer. Friendly folks running the park. Supper easy pull thrus with what amounts to a vacant normal space on each side of us with this back to back layout. Cross a street and up the stairs and your at the town market. Three doors down a side street and a family Mexican American restaurant will fill you up from 8:00am to 8:00 pm. This is a small park with folks who want your visit to be fun and it was. We camped at Picketts RV Park (formerly Alamo RV Park) in a Travel Trailer. This is one of those parks that are in the middle of nowhere by the side of the road. Lots of permanent residents and junk all over. Dogs running loose. There just isn't anything here but it could work in a pinch at the end of a long day. Not really a good place to stay. I wouldn't stay here again. 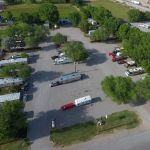 We camped at Picketts RV Park (formerly Alamo RV Park) in a Travel Trailer.